Now ... most the design we have available is ... "God always forgive ... God is Love" ... and I say, "Yes, God is Love, but because It is Love ... It also have Wrath ..." ... otherwise the Evil Ones never will learn a bit of God. The Seven Vials ... are ... 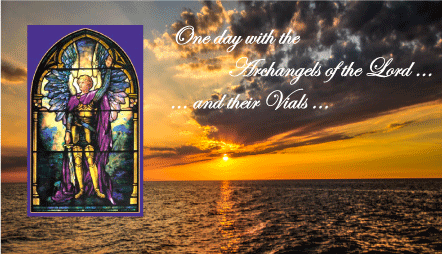 Seven multiplied by 2=14 ... because there are Male and Female Archangels ... where Mary, Mother Mary is one of the she ... Faith, partner of Michael is another ... Hope with Gabriel, Christine with Jophiel, Aurora (like now that are the first hours ... of the day) with Uriel ... and Amethyst with Zadkiel ... called also the Seventh Archangel ... but is more Saint Germain the one represented in the Book of Revelation and they, of course ... work together. Thus ... Holy Friends ... is not that God is fool, God is weak and Evil is strong and you need to use drugs, listen Rock, adopt Black Clothes and Delinquents and Mafia, and Bankers and Babylon will evolve forever ... Nay. Yes ... This is the Place ... Our Planet is and has been the Space where Evil grew in Time for Millennium ... they are in Fight against Light ... but ... there are no Hope for them ... Their days are counted ... This World will not fall in the Abyss, they plan ... to prove God was a fool given Free Will to us ... their Children ... They ... the Dark will leave and Order will be established. And Angels are of Both Polarity ... White and Dark ... A Demon is a Dark Angel ... that live in the Mind of Ignorant Men and Ignorant Women ... when that person begin to Walk and Study ... the Demons ... representing their Fears, their Ignorance, their Arrogance, their Anger, their Low Melodies are destroyed and that Dark Energy ... leave that Mind and is replaced by White Harmonic Simphonical Order ... which after some years become Strong Intelligence ... No one have recovered all its Light in one year or two ... it takes time. Now ... in the release of my books ... Volume 2 ... The APE ... The Apocalypse explained ... in English 2009, and in Italian in 2012 ... not yet in Spanish, my first language ... and honestly I say "Thanks, Lord" because only in this year I got impressive wonderful information ... directly from "John the Beloved", who wrote that book 2000 years ago, and that information will belong to new editions. Now ... When I, John (Giovanni in Italian, or Juan in Spanish) ... tell you ... "The book of Apocalypse explained by ... " "Archangel Michael" ... well is not me ... but Archangel Michael that has been included in that book ... when I say, "Archangel Gabriel" ... well is not me ... but Gabriel ... When, I say ... "Mother Mary" is Mother Mary ... I AM not inventing ... I AM re-offering their Words ... and Italian Edition offer many chapters directly from the very Word of Master Jesus ... first announcing his return in 2009, then when he back in Physical. Italian Edition of the Book of Apocalypse included more of these messages of the Archangels than English Edition, because Italian people have been under the influence of the Catholic Church for over 2000 years, and nothing know about these concepts and messages. Therefore, these were translated to Italian and offered in that book, dated 2012, five years ago. Of Course there are also other many discourses more recent ... from Mother Mary and the Archangels, included in the Book ... from other sources, not public we offer like a Gift and available only and exclusively in the Book. Yes, God is inclusive.